Even though his 2016 run for the Democratic presidential nomination ended in a loss to former Secretary of State Hillary Clinton, the campaign Sen. Bernie Sanders (I-Vt.) launched what he calls a political revolution. According to Mr. Sanders, the issues brought to the forefront of political debates—such as free public college, Medicare for all, $15 federal minimum wage, affordable housing, immigration reform, criminal justice reform and gun safety legislation— were the same causes he fought for when he campaigned and continues to fight for today. The book picks up immediately after the 2016 primary election when he met with Ms. Clinton to discuss next steps. Then, they devised a plan to bring their campaigns together and developed “the most progressive platform in the history of American politics," he said, which they hoped would bring people together and help her win the election. On election night, he said, he thought it was likely she would win but wouldn’t have been surprised if Donald Trump won. Mr. Sanders followed his normal election-night routine: watching election returns at his Vermont home with family and friends. He would speak to people and the media after election results came in, but on that night, he said, he was too depressed to leave the house. "It was clear to me, if not all my supporters, that on her worst day, she would have been a much better president than Trump,” Mr. Sanders said of Ms. Clinton. He was again working to figure out next steps and determined that the political revolution that began with his campaign could not stop. The Democratic Party needed fundamental reform, and as the newly-selected outreach chair for Senate Democrats, Mr. Sanders knew they needed to take their agenda to the often-ignored rural states while educating more Americans on the issues and the political process. Mr. Sanders said he will continue to do everything he can to advance the progressive movement and go forward with the political revolution. "We could not linger in despair or depression,” Mr. Sanders said. “Our task, for the sake of our kids and our grandchildren, was to stand up and fight back and take on this type of ugly, reactionary politics. Sen. Bernie Sanders criticized President Donald Trump during a Tuesday night discussion on his book, "Where We Go from Here: Two Years in the Resistance." In a Q & A after his speech, Bradley Graham, owner of Politics and Prose, asked the senator a series of questions submitted by the audience on topics such as climate change, DACA, foreign policy, affordable housing and anti-Semitism. Mr. Sanders was also asked about how close he was to deciding whether to run for president again. He said that he and his team are in the process of assessing his viability as a candidate, and he will only run if he concludes that he is the strongest candidate to challenge Mr. Trump. "What I believe from the bottom of my heart is that it is absolutely imperative that Donald Trump not be [re-]elected president of the United States of America,” Mr. Sanders said. “I'm going to do everything that I can to make certain that that does not happen." But there is some hope for the future, Mr. Sanders said. He noted that even though there are divisions within the country, he believes the American people share a common vision for the future of the country. “If we do not allow Trump and his friends to divide us up based on the color of our skin or where we came from or our sexual orientation or our religion, if we stand together and fight for an agenda that fights for all of us and not just the people on top,” Mr. Sanders said. CNN town hall at George Washington University offers opposing points of view on what should happen with the Affordable Care Act. 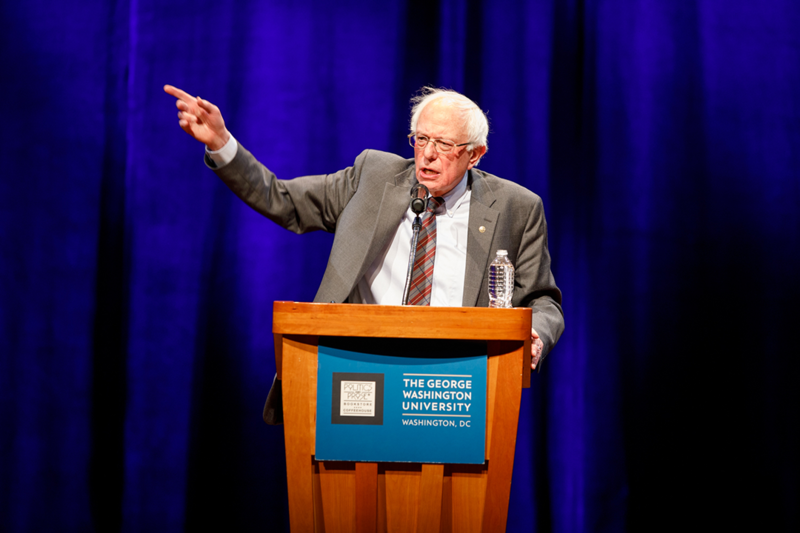 The Vermont senator visited GW to talk about governing under the Trump administration and saving health care reform.